Avon Black & Yellow Stickers. 4" or 6.5" Pair. Avon Crossed Flag Classic 50's & 60's Stickers. 1.75", 3" or 5" Pair. Avon Motor Tour of Britain Sticker. 7". Avon The Performance Tyre Motorcycle Sticker. 5.5". Avon Tyres Large Spot Sticker. 14". Avon Tyres Large Spot Stickers. 10" Pair. Avon Tyres Outline Style Spot Sticker. 9.5". Avon Tyres Outline Style Spot Stickers. 3" Pair. Avon Tyres Streaked Cut Vinyl Stickers. 6" Pair. Avon Tyres Streaked Oblong Stickers. 6.5" Pair. 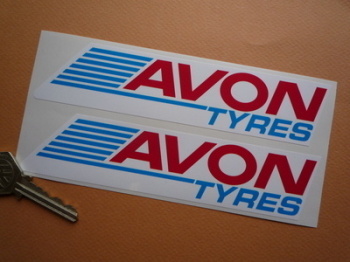 Avon Tyres Streaked Shaped Stickers. 8" Pair.